The essence of Thanksgiving in liquid form. 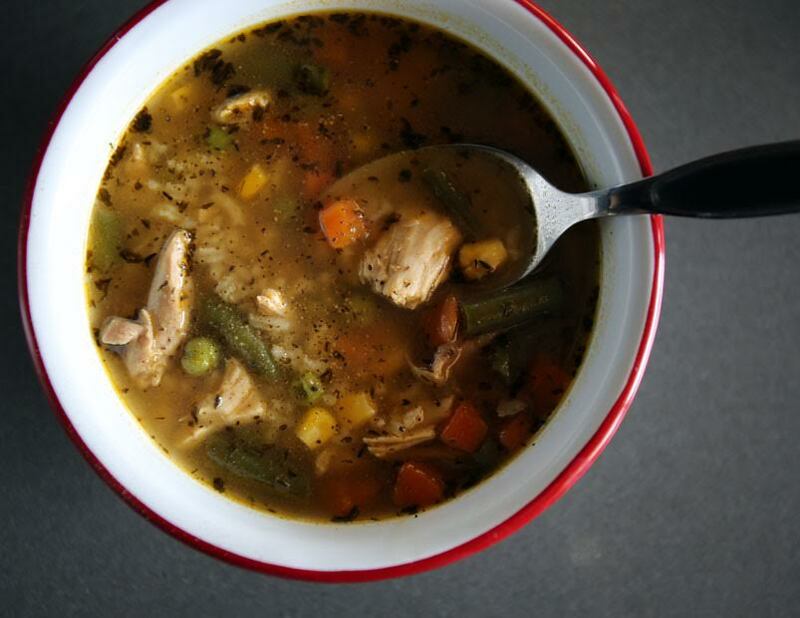 This soup extracts every last bit of goodness from the poultry remains. Resist the urge to pick the bones clean before using this application. A little meat in the soup, especially dark meat, will up the flavor ante considerably. Put the broth and carcass in an 8-quart pot over low heat and bring to a simmer. Cover and cook for 1 hour. Add the vegetables, rice, turkey meat, Old Bay, and thyme to the pot and simmer for another 20 minutes. Season with salt and serve along with the pepper grinder. I don't know why it is turkey seems to be able to take so much pepper, but by the time I'm through with it the bowl is teeming with wee black bits. And I'm not a huge black pepper fan. DARN IT! I just made a turkey this week and threw my carcass away before checking for recipes. I didn’t feel like dealing with it until I saw this. I do have every scrap of meat that I could get off of it though…although I know boiling the carcass has a particular purpose. BOO. 🙁 Anything I should do to make up for not having the carcass?? Is the rice cooked when added to the pot? If starting from scratch with aromatics and water, instead of vegetable stock, would this be even better if I further roasted my turkey carcass and aromatics prior to putting them in to the stock pot? Or would that make the stock too rich? I saw this just as I finished the last drop of this year’s soup. I always start cooking as I clean up from dinner. It’s easier to put away soup than a carcass. I adjusted my mom’s recipe this year and it was my best ever: I don’t use broth,I just make a broth out of the carcass which I cover around 2/3 the way in a big stock pot. I added a few handfuls of mixed lentils and cooked for around 2 hours. There was still some turkey meat on the carcass. then I added a bag of frozen roasted cauliflower from trader joes and cooked some more. That cooled and I refrigerated it over night. The next day I added a cup of fresh peas, 2 cut up carrots, salt and pepper (a lot of each–Alton is right). I can’t describe how good it was. ANYONE USE THIS RECIPE FOR CHICKEN?? WE DIDN’T DO A TURKEY THIS YEAR. INSTEAD DID RIB ROAST (RIBEYE??) . TOOK 2 HOURS & WAS WONDERFUL.THAT WAS WITH ALL THE FIXINGS. CLEAN UP WAS 15 MINUTES. CUT EVERYTHING DOWN BY 4 HOURS. DON’T THINK WE’LL DO TURKEY AGAIN. MAYBE JUST DO IT WHEN THERE’S NO RUSH. I’m planning on doing this tomorrow. I usually do my own turkey soup after the holiday, but it’s been a bit bland. I’m hoping this recipe will spice it up a bit. Only problem is, I don’t have any leftover meat apart from what’s left on the carcass, which is good, but nowhere near two cups worth. We’ll see how it comes out. I made this soup and it is delicious! I do recommend that you use a very low salt vegetable broth to start with. Also, I substituted pasta for the rice. Frozen vegetables?! I never thought I’d EVER see that ingredient in an AB recipe . . Especially when you can get fresh veggies year round. I do, in fact, have access to fresh veggies grown in both hydroponics and greenhouses, and they’re not prohibitively expensive. The only veggies that freeze “well” are the robust cruciferous (broccoli, cauliflower, etc) and those are easy to get fresh year round. I still stick to my original statement. The only reason I’d choose to use frozen veg over fresh would be if the zombie apocalypse is upon us, and in that case, it wouldn’t really matter anyway. Has anyone tried making this without using the carcas? Perhaps using chicken broth instead of vegetable? Thanks! I love how the comments are filled with recipes. I can’t find the recipe for the soup! All I get are the comments. When I search AB recipes I’ll get a glimpse of the recipe, or if I click on the picture, again just a glimpse and then only the above comments. What’s wrong? That’s really odd. I see it fine. Here ya go! Season with salt and serve along with the pepper grinder. I don’t know why it is turkey seems to be able to take so much pepper, but by the time I’m through with it the bowl is teeming with wee black bits. And I’m not a huge black pepper fan. same here, no recipe only comments ?? This may be my favorite recipe by AB! Highly recommend using the meat and bones from a SMOKED TURKEY. Fantastic. My favorite smoked turkey comes from Greenberg Smoked Turkey, inc. in Tyler, TX and the best part is that they can be ordered online. Mine too! In fact I am looking for a soup recipe for a Greenberg Smoked Turkey that we had for Thanksgiving! Just made this. It was outstanding. Different so it doesn’t taste like any other soup! Thanks AB! Please advise: My rice is sinking to the bottom of the pot. Is that supposed to happen? Wish I could attach a photo to this message so you could see. Looks fantastic! Gonna have to try it! Might add some black beans to add a bit more protein and fiber! Thanks again Alton, you’re a genius!!! Used an applewood smoke. Turkey was moist and delicious. How does smoked turkey do for a soup? This a recipe I have used for Old Bay Seasoning in a pinch. Good recipe. We deal with the soup a little differently. We strip the carcass on Thanksgiving and use it, along with celery and onions, to make a stock–cook it in a big slow cooker overnight. We then make different soups over the next few days. One of the best is stock, some of the left over dark meat (stored as part of clean up), left over wild rice, a bit of gravy to thicken, seasoned to taste. This may seem strange but here in Australia you cannot get “Old Bay seasoning” what is it a mixture of? agree with the pepper tip. never let a carcase go by. A quick wiki search shows that Old Bay seasoning is a branded mix of spices made by McCormick, an American spice manufacturer, historically used to flavor crabs. There is a general consensus of the ingredients (10 – 15) that can be found in numerous recipes online, although of course ratios will vary from taste to taste. This was adapted from Aliza Green from Field Guide to Herbs & Spices. A little different from the recipes already here. Traditionally, this seasoning is used for steamed crabs, but is now used for fish, potato salad, potatoes, and other vegetables. This would also make a great gift, along with some recipes! Enjoy! 1. Combine all ingredients in an airtight jar, mix thoroughly. 2. Keep sealed until ready to use. 3. To give as a gift, place in a pretty jar, along with some recipes. This would look nice in a basket, maybe with some measuring spoons, and ingredients for one of the recipes you give. Enjoy!